You may have heard of it, you might even own some but let's take a look at microfilm, what it stores and what alternatives you can use. 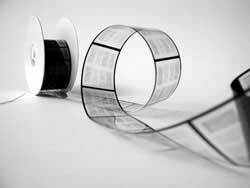 A Microfilm- (noun) A small piece of film containing minuscule images (microphotographs) of documents which cannot be viewed by the naked eye, only by specialist microfilm readers. To Microfilm-(verb) The process of converting documents to small scale images to store on a microfilm to save storage space. Microfilm have been around since the early 1900s and the first recorded use of them was in the 1920s by a city banker from New York named George McCarthy. He used his 'checkograph machine' to make 'permanent copies of all bank records.' Since then, they have played a vital role in history from their use in the Franco-Prussian war and World War II to it's adoption by libraries across the UK to store historical archives. Microfilm have been used to store documents in a more compact and space saving way for companies that need to store documents with a long file retention period. They can store anything from newspapers and engineering drawings to smaller documents like cheques and betting slips. 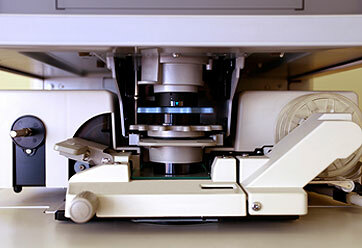 Rare documents are also stored on microfilm to preserve them from the damage that paper storage is susceptible to. While microfilm do offer some benefits for document storage, there is an alternative method which offers a great deal more. By scanning, updating and digitising microfilm, organisations have found a useful way to modernise the storage of important documents. Microfilm scanning can save organisations the time, money and space involved in retrieving files from microfilm and make documents more flexible to view, edit and share. Due to the expense of microfilm usage, particularly buying microfilm readers, and the rise in popularity of digital methods, microfilm is gradually becoming obsolete. More and more organisations are turning to microfilm scanning to reap the cost and space saving benefits, while safeguarding their archives through digital storage. Here at Pearl Scan, we offer a bespoke yet cost effective microfilm scanning service that is perfect for updating your document storage method. We can provide you with fully digitised and OCR processed documents in a range of formats to suit your preferences. We have even recently invested in a new microfilm scanner to help us provide the best possible service for our clients for microfilm scanning London, microfilm scanning Manchester and microfilm scanning across the UK. If you would like some more information about the microfilm scanning services we offer, feel free to check out some of our other articles or get in touch today for a free, no obligation quote for your scanning project.